The National Thoroughbred Racing Association, Daily Racing Form and the National Turf Writers and Broadcasters announced this evening that Gun Runner, a winner of four Grade 1 races culminating with the $6 million Breeders’ Cup Classic, was voted the 2017 Horse of the Year at the 47th Annual Eclipse Awards Ceremony at Gulfstream Park in Hallandale Beach, Fla. 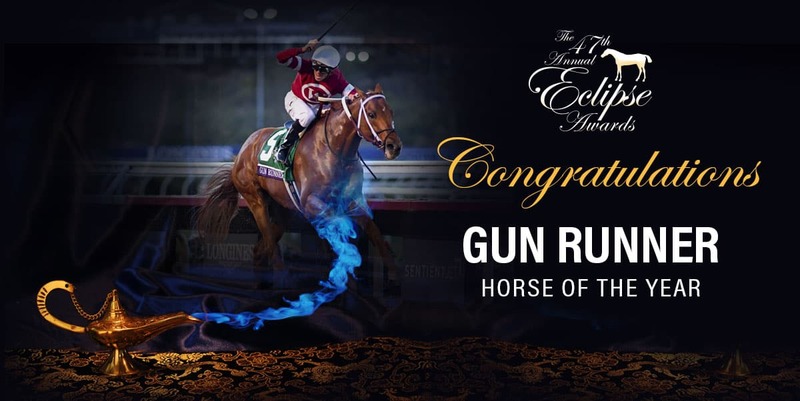 Owned by Winchell Thoroughbreds LLC and Three Chimneys Farm and trained by Steve Asmussen, Gun Runner received 248 out of a possible 250 first-place votes for Horse of the Year. Juddmonte Farms’ Arrogate, who was last year’s Champion 3-year-old, received two first place votes. Gun Runner, who was also named the Champion Older Dirt Male earlier in the evening, won 5 of 6 starts during his 4-year-old season, including dominant victories in the Razorback Handicap at Oaklawn Park in April, the Stephen Foster Handicap at Churchill Downs in June, the Whitney and Woodward at Saratoga in August, and then finished the year with a front-running 2 1/4-length victory in the Classic at Del Mar. Gun Runner’s only defeat last year came in the $10 million Dubai World Cup in the United Arab Emirates, when he finished second to Arrogate. Gun Runner later turned the tables on Arrogate, who dead-heated for fifth in the Classic. Gun Runner, ridden in all of his races last year by Florent Geroux, finished the year with earnings of $6,950,700. A chestnut son of Candy Ride (ARG) out of Quiet Giant by Giant’s Causeway, Gun Runner was bred in Kentucky by Besilu Stables. Gun Runner is scheduled to make his final career start in Saturday’s $16 million Pegasus World Cup at Gulfstream Park, and then will be retired to stud duty at Three Chimneys Farm in Versailles, Kentucky. With the crowning of Gun Runner, Steve Asmussen becomes the first trainer since the Eclipse Awards began in 1971 to train the Horse of the Year winner on four occasions. In addition to Gun Runner, Asmussen, a member of Thoroughbred Racing’s Hall of Fame, trained Curlin to Horse of the Year titles in 2007 and 2008 and the filly Rachel Alexandra in 2009. In other awards tonight, two horses from the barn of Hall of Fame trainer Bob Baffert captured the 3-year-old male and 3-year-old filly titles. Gary and Mary West’s West Coast, winner of the Travers and Pennsylvania Derby was named Champion 3-year-old Male, and China Horse Club’s Abel Tasman, winner of the Kentucky Oaks and the Coaching Club American Oaks, was named Champion 3-year-old filly. The Champion 2-year-old Male title went to Sentient Jet Breeders’ Cup Juvenile winner Good Magic, who is trained by Chad Brown, who was also named Outstanding Trainer for the second consecutive year. Juddmonte Farms, which campaigned Arrogate to victories in the both the Pegasus and Dubai World Cups, was named Champion owner, and Clearksy Farms, breeders of Arrogate and Abel Tasman, was named the Outstanding Breeder. Jose Ortiz, who led all riders with more than $27 million in earnings, was named Champion Jockey. In voting that concluded Jan. 2, 2018, Eclipse Awards voters cast their ballots to rank the top three horses and individuals in each Championship division on a 10-5-1 point system basis. This voting established the top three finalists in each division, whose names were released on Jan. 5, 2018. Good Magic, 131; Bolt d’Oro, 113; Catholic Boy, 3; Firenze Fire, 1; Mendelssohn, 1; Solomini, 1. Caledonia, Road, 161; Rushing Fall, 68; Moonshine Memories, 17; Dream Tree, 2; Dream It Is, 1; Road to Victory, 1. West Coast, 229; Always Dreaming, 14; Battle of Midway, 5; Irap, 1; Mastery, 1. Abel Tasman, 244; Unique Bella, 5; Elate, 1. Gun Runner, 247; Arrogate, 3. Forever Unbridled, 237; Songbird, 8; Stellar Wind, 4; Voter Abstentions, 1. Roy H, 241; Imperial Hint, 5; Drefong, 1; Mind Your Biscuits, 1; Stormy Liberal, 1; Voter Abstentions, 1. Unique Bella, 90, Paulassilverlining, 60; Ami’s Mesa, 41; Bar of Gold, 36; Lady Aurelia, 8; By the Moon, 5; American Gal, 3; Finley’sluckycharm, 1; Voter Abstentions, 6. World Approval, 211; Beach Patrol 20; Talismanic (GB), 11; Highland Reel (IRE), 8. Lady Eli, 203; Wuheida (GB), 33; Off Limits, 12; Cambodia, 1; La Coronel, 1. Scorpiancer (IRE), 92; All the Way Jose, 70; Mr. Hot Stuff, 35; Modem (GB), 7; Diplomat, 4; Swansea Mile (IRE), 3; Voter Abstentions, 39. Juddmonte Farms, 143; Winchell Thoroughbreds, 31; Godolphin Racing, 21; Sol Kumin, Head of Plains, Sheep Pond Partners, 19; Klaravich Stables, Inc., and William H. Lawrence, 11; Calumet Farm, 7; End Zone Athletics, 3; Charles Fipke, 2; Coolmore, 1; e Five Racing Thoroughbreds, 1; Fox Hill Farm, 1; Live Oak Plantation, 1; John Oxley, 1; Stonestreet Stables, 1; Voter Abstentions, 7. Clearsky Farms, 141; WinStar Farm, 72; Charles Fipke, 8; Belisu Stables, 7; Live Oak Stud, 6; Godolphin Racing/Darley, 4; Brereton C. Jones, 3; Adena Springs, 1; Calumet Farm, 1; Kenneth and Sarah Ramsey, 1; Voter Abstentions, 6. Chad Brown, 215; Bob Baffert, 16; Steve Asmussen, 13; Mark Casse, 2; Todd Pletcher, 2; Voter Abstentions, 2. Jose Ortiz, 189; Mike Smith, 45; Irad Ortiz, Jr.,10; Javier Castellano, 4; Voter Abstentions, 2. Evin Roman, 232; Katie Clawson, 4; Jenn Miller, 1. Voter Abstentions, 13. The recipient of the Award of Merit, voted on by a panel of representatives from the three presenting organizations and previously announced, is Frank Stronach. The Award of Merit is presented to honor outstanding lifetime achievement in the Thoroughbred industry. The recipient of the Special Awards, as voted by a panel representing the National Turf Writers and Broadcasters and Daily Racing Form, and previously announced, are San Luis Rey Downs/Camarero Racetrack Rescue and Response, and the National Thoroughbred Racing Association for improvements in federal regulations for horseplayers and the industry. Live Racing Programming – NBC Sports – “2017 Kentucky Derby,” Rob Hyland, Coordinating Producer; May 6, 2017. Television Feature – NBCSN – “My Kentucky Home,” Tom Hammond, Narrator and co-producer; May 3, 2017. Audio/Multi-Media and Internet – Daily Racing Form – “Chasing Man o’ War’s Ghost,” Barbara Livingston, writer, photographer and narrator, March 24, 2017. Writing – News/Enterprise – Denise Steffanus – “A Call for Common Sense Testing,” Trainer magazine, February-March, 2017. Writing – Feature/Commentary – Jason Frakes – “Gunnevera Trainer Kidnapped Twice, Now in Kentucky Derby,” which was published in the Louisville Courier-Journal on April 30, 2017. Photography – Nancy Rokos – “Fractious Two-Year-Old,” Burlington (N.J.) County Times, October 7, 2017.